"My" is the learning CPD area designed to help you progress through your CPD modules, work through the questions until you reach the required pass mark. 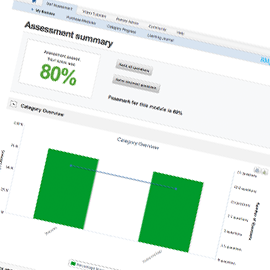 You can track your progress with our reporting tools and print or upload your CPD certificates as proof of learning. Questions in your modules will test your knowledge, improve and develop your understanding and provide you with essential references to industry standards. On completion of a module, you can save and print your learning log and certificate. Your certificate will be signed by the Society of Chiropodists and Podiatrists Chief Executive - Joanna Brown. 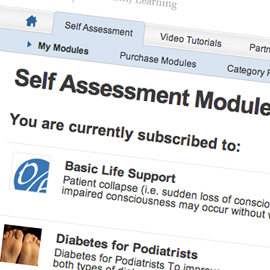 There are a number of ways to select your CPD modules. You can make life easy and purchase one of our bundles, giving you 5, 10 or 15 pre-selected modules or you can hand pick your own package from our portfolio of modules. The module unit price will decrease the more selected. Use the "My" platform to access your CPD modules at any time, 7 days a week, 365 days of the year. Access to "My" and your modules will last for 12 months. Answer questions, read explanations, and re-sit the modules until you achieve your pass mark. Don't forget to log your reflections in your Online Journal. Print your Online Journal and Certificate for evidence to include in your portfolio in readiness for your appraisal. Add the package that most interests you to your shopping basket; you can start your modules immediately or at a time to suit you over the next 12 months.